By now, you are so over winter. The snow we thought was so pretty a month ago? Ug. I have to admit it has been a rough one. The extreme cold has been wrecking havoc on my skin and everyone in my family has been unwell for the past couple of weeks. My daughter’s school even closed one day last week because so many children were ill.
And we still have a few more weeks to go. Here’s a guide for surviving (even thriving?) these last few weeks of winter. 1. Now is the time to buy a coat. The one I’m wearing here was only $15 and it has definitely made me feel better about all the cold. As much as I want it to be spring, I’m not going to pass up a deal like that. 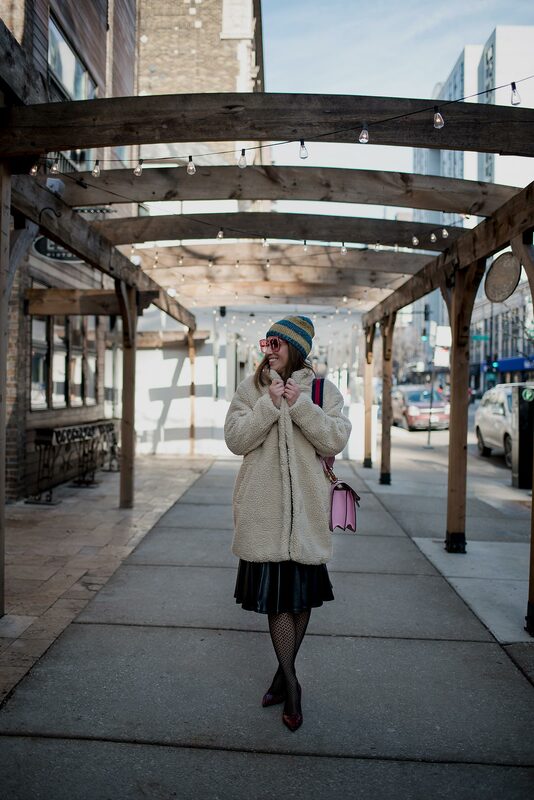 This coat is sold out online but you might still find it in an H&M store; I saw a bunch (in small and large) today at the Michigan Avenue store. I have also been seeing a lot of cute coats online; check them out below. 2. Pull out your sunglasses—especially if they make a statement. 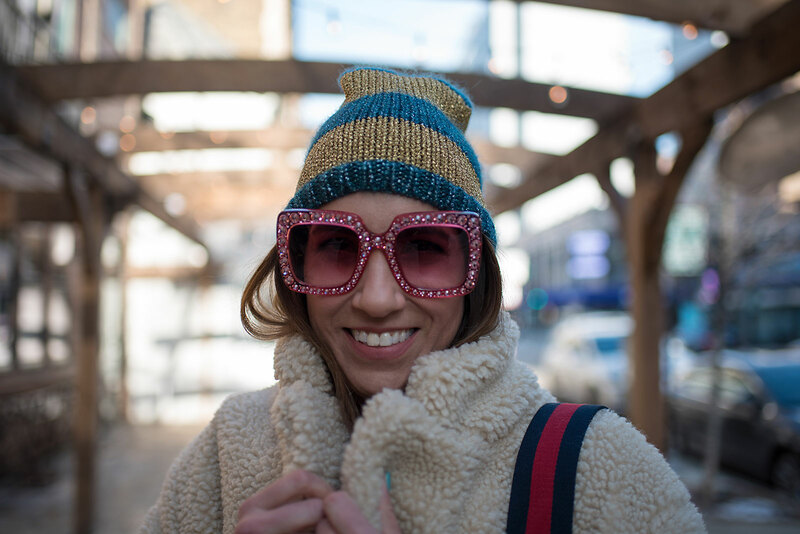 You may not wear your sunglasses during the winter but you should. I found these on sale at Matches Fashion in late December and couldn’t wait to wear them. They definitely add some brilliance to an otherwise dreary day. 3. Get some pattered tights. I always buy Wolford on sale this time of year. The patterned ones like the one I’m wearing here are a nice change from heavy tights and are still warm enough. 4. Go for color. I recently bought a super bright pink sweater from Topshop and I want to wear it all the time. I also bought this bright orange one from H&M. (It’s $19.99 online but was only $10 in the store just now.) These sweaters feel transitional but are still super snug. 5. Buy something cozy to wear to your fitness class—one of the puffer coats linked here or a new pair of leggings or a sweatshirt. It will get you out the door and working out will make you feel a million times better. I like the Beyond Yoga leggings in the winter because they are soft and warm but not too hot or constricting in a heated class. Morning routine: PCA Skin Ideal Complex Revitalizing Eye Gel + Rodin Face Oil (more options for oils below) + Supergoop City Sunscreen Serum. I splash water on my face in the morning and then apply the PCA Skin eye gel. After that sets, I put a few drops of the Rodin oil on my palm and dab it all over my face. I let that sink in and then I apply SPF. Nighttime routine: Cauadlie Gentle Buffing Cream + 3Lab Super Eye Treatment (I had a big sample of it; other eye creams below) + PCA Skin Collagen Hydrator. I picked up the PCA Skin and Caudalie products after reading about Margo and Me’s routine. I have used NARS Skin as a moisturizer, which is thick and luxurious, and Kerstin Florian Rejuvenating Cleansing Gel, which I discovered during a facial at a fancy spa and would buy again. I would probably buy the PCA Skin products again as well. They are fairly reasonably priced compared to a lot of skincare products and both definitely do the trick: the moisturizer is very nourishing and the eye cream is firming and brightening. I also wanted to try an exfoliator since I do a lot of hot yoga and the Caudalie is very gentle. I’m resolving to keep this going from here on out. I know I probably need a retinol and who knows what else. Overall, I do feel less is more when it comes to your skin and it’s more important to eat well, exercise and drink plenty of water. KEEP MOVING I don’t know what I would do without my heated yoga sculpt class, especially in winter. This class combines weights, cardio and yoga in a heated class that feels like a tropical island. DRINK UP I make smoothies for my family every single day, or at least during the week. I like knowing that whatever else my daughter eats for the day, she has had a major dose of vitamins to keep her brain humming. I use spinach, blueberries, a banana, coconut almond milk, fresh orange juice, pomegranate juice, chia seeds and for days when she stays after school for a club, a spoonful of almond butter for the protein. This is Us Sniffle. I’m a few episodes behind and have gone to extreme lengths to avoid spoilers. Homeland It appears season 7 is ripped from the headlines. The Affair I thought the first episode of this show was absolutely ridiculous. A show about an affair? Not really my thing. But then I caught an interesting snippet of a later episode and was pulled in by the subplot: a murder. This show plays more like a juicy novel with superb character development. Critics have widely panned it but I disagree (and apparently so do many others as we are now on season 4). Television critic Emily Nussbaum and I do agree on The Americans; see below. Billions Damien Lewis and Paul Giamatti are terrific on this show. The Americans This is last season of this excellent show. There are parts that make you hold your breath. I always say they know how to build a scene better than anyone else. Stay warm and be well.